I am a homeschooling mother of three. I recently named our homeschool and incorporated the name to offer tutoring and testing for income (in my home). What do I need to do to report the income to the IRS. Should the name be a LLC. or S-Corporation? If you can shed some light on how I need to handle this, I would greatly appreciate it. I need the income to continue homeschooling, and this is unfamiliar territory for me. Thank you in advance for help. Thank you for contacting me. I wish you the best of success in your new endeavor as a business owner! It can be exciting and overwhelming at the same time. You said you incorporated the name. What specifically did you do? Did you merely register the name or did you file incorporation papers with your state? There is a big difference with respect to taxes. Sole proprietors file a Schedule C as part of there individual Form 1040. A Schedule C shows all the income and expenses of the business. Corporations have different IRS forms that are much more complex and usually require a CPA to prepare. I hope that helps. There is a lot to learn! The Nonprofit Law Blog explains that the duties of a secretary of a nonprofit is more than attending meetings. A secretary will be most useful to an organization when his or her role is catered to meet the unique structure and needs of the organization, rather than filling a “one-fits-all” job description. For example, these duties often increase when the corporation is a membership organization, giving members the right to elect the directors. Duties may additionally change from time to time as may be assigned to him or her by the board. Copies of EVERYTHING ever mailed to or received from any branch of the government, IRS, state or local. Pass this permanent file to the next secretary as board members change. Many homeschool organizations depend on fund raisers to help run their homeschool co-ops and support groups. These fund raisers could actually harm a group’s chances of obtaining tax exempt status. Julie is treasurer of a homeschool co-op in OK that desires to file for 501c3 tax exempt status with the IRS. I examined her financial statements and saw that the group depended heavily on profit from fund raisers including candy, food and flower sales. These fund raisers required Julie to collect over $12,00o a year in sales. The co-op made a profit of nearly $4,000 every year from their fund raisers. The profit from the fundraisers was actually more than the amount collected in co-op dues. Unfortunately, with most of the co-op’s income coming from fundraisers and not co-op fees, the IRS may not grant Julie’s co-op 501c3 tax exempt status. The IRS requires a significant portion of your income come from public support (i.e., the dues from your co-op families) and not from an “unrelated businesses” (i.e. selling products in a fund raiser). The IRS defines “significant” as having more than 1/3 of your income come from public support. Fortunately for Julie’s group, the IRS has several exceptions. One of them worked for Julie’s group. Her fund raising efforts were all done by volunteers and so the IRS considers that fund raiser as part of the group’s support and they meet the 1/3 test mentioned above. The IRS rules and exceptions get a bit complicated and both the homeschool leader, Julie, and I did our research. We will be very careful and thorough when explaining the fund raising programs to the IRS when Julie’s co-op files for tax exempt status with the IRS. What does the IRS mean by not allowing “private benefit” in a fund raiser? 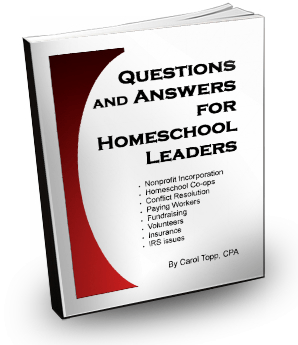 Also, my ebook, Question and Answers for Homeschool Leaders addresses fundraisers in detail. Order a copy (in pdf format) for immediate dowload for $8.00 here. …working to keep you on the right side with the IRS! Finally, attend my free webinar on Fund Raising in a Homeschool Group on Tuesday, November 30 at 8:00 pm EST, 7:00 pm CT. You can listen in on-line and participate in the chat room or phone in and attend the webinar that way. For details on the login in information, phone number to call and workshop handout, click here. Feel free to tell other homeschool leaders in your area about my webinar. The more, the merrier! There is no charge for the webinar, except long distance phone charges if you call in . Other issues are addressed as well such as whether the income from a fund rasier is taxed and whether a family can hold a fundraiser for their individual homeschool. Many homeschool groups bring in needed income through fundraisers. Through experience I have found that some fundraisers are much easier to conduct than others. Although very common, selling products door to door is one of the hardest ways to raise money because managing the orders, delivering the product, and storing inventory is a lot of hard work. My homeschool group had tried selling products in the past, but we wanted an easier way to bring in funds. We found several ideas that have worked well for homeschool groups including reward and coupon programs, fund raising dinners, donation drives and website income. I am a 15 year homeschooling veteran who started a co-op last fall. I am now being asked by my church for ‘official’ documents to include: business status, liability insurance, tax information. I have a checking account for our co-op. We offer 30 classes, one day a week, for 5 hours. Six of the 30 classes are paid classes. The student gives the co-op ~$2.00 each class. I write a check to the teacher for $20.00 each time they teach. The teacher always makes $20.00. The student pays a varying rate dependant upon how many students are in the class.What business status do I need? What tax forms am I required to file? What type of liability insurance do I need if the parents are always on site and never drop off students? Thank you greatly for the information. Good for you for starting a homeschool co-op. I’m sure it is a blessing for many families.Your business status could be a for-profit or a nonprofit. It depends on whether you own and run the co-op as your businessor whether you have a board to make decisions. It also depends on how you opened up the checking account (although that can be changed). Did you use your personal name and SSN? Then you would be a for profit sole proprietorship. Or did you organize without a profit motive and assemble a board to lead the group? Then you are a nonprofit. Choosing a leadership teamThe tax forms depend on your business structure. Sole proprietors report business income on Schedule C of their 1040. Most nonprofits apply for 501c3 tax exempt status to avoid paying taxes on their surplus. There can still be a need for insurance, even if parents stay on site. Accidents can happen, damage to property can happen. You might benefit from reading my article on Insurance for homeschool groups. Since you are paying teachers, you should read my ebook Paying Workers in a Homeschool Organization. You need to determine their worker status as either employees or independent contractors and be giving them a W-2 or Form 1099MISC showing their wages. You can learn a lot by listening to a podcast I recorded on Paying Workers. 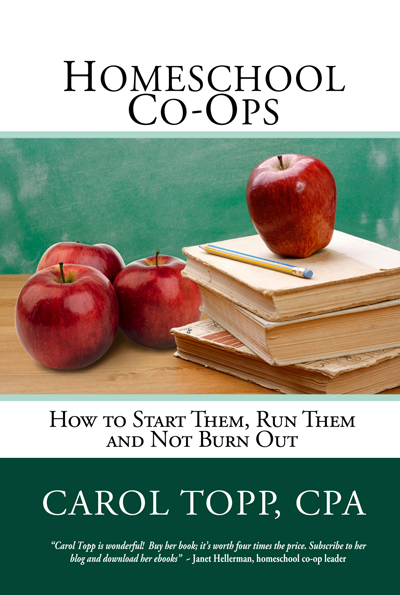 My book Homeschool Co-ops: How to Start Them, Run Them and Not Burn Out covers a lot of your questions. It is available in print or electronic format. Read more here.I hope that helps! Do liability waivers really protect homeschool leaders? You don’t think of homeschool groups as engaging in potentially dangerous activity, so the whole idea of waivers and liability insurance may seem unnecessary. Yet many groups are increasingly called upon to obtain liability insurance. The insurer may insist on your group having a release of liability form or a liability waiver. 1. If someone signs a waiver, they can’t sue us. This is not true. An injured party can still attack the validity and scope of a waiver. 2. If I have a waiver signed, I send it to the injured party’s lawyer and they won’t sue. Also not true. As a homeschool group, you still need to report the claim to your insurance company along with sending them a copy of the waiver to be used as part of your defense. 3. If I have waivers signed, I don’t need insurance. Definitely not true! In fact, if you have insurance, the insurer will often insist that you obtain waivers or releases from participants. An enforceable waiver of liability is one which is prepared in accordance with state law, sufficiently describes the risk and is understood by the reader. 1. Remember, minors generally cannot release liability. Parents or guardians must sign the release on behalf of the minor. 2. A release can only release from ordinary negligence. In other words, if there is gross negligence or intentional injury, the release will not be effective. 3. The language of the release must be in compliance with the state law and the signer must understand the language of the release. Look for language barriers or other inability to understand. It is always good to have an attorney licensed in your state take a look at your liability waivers or releases. Doing so provides the best possible protection for your group as well as your directors. Thank you, Christine, for your reply and insight into the best use of liability waivers for homeschool leaders. 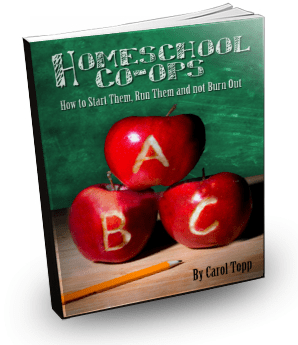 Have you ever tried team teaching in your homeschool co-op? Most homeschool parents are pretty independent, or may have a Lone Ranger mindset and may never consider team teaching. But you may be missing out on something good. Elain from The Community Co-op blog shares how well team teaching worked for her. Team Teaching Saves the Day! After all, it’s one thing to homeschool your own children, quite another to plan an entire semester, and lead a class of 12 or more children! Some of us had prior teaching experience in some form or another, one teaching in a school, another teaching adults in continuing education — but most parents coming in as volunteers wouldn’t have that. Lori had the idea of Team Teaching. The idea is that two parents are the Leads of the class and lead as, well, a team. The two leads plan the class together and teach together. If one person is having a hard time with a project, or an explanation, the other team member is there to step in and help out. Another part of the team work is ongoing debriefing, checking in, how’s it going? How did I do today? Was that clear? Did the class flow well today? Do we have the right number of stations set up? Initially, I was hesitant about this team teaching thing. Bit of a Lone Ranger type. In our first year of co-op, I didn’t have a co-lead, it just worked out that way, there didn’t happen to be someone available. This year, I do, and it’s great! No more Lone Ranger for me. My co-leader and I got together to plan our class, Studio Art. She had a wonderful idea that I never would have had — why not have as our organizing theme, the history of art? You know, the entire history of art, starting with the cave paintings? One semester in to the plan, it’s going great. The class this year is larger than last year, but since we have this teaching team in place, class actually feels easier. After the Winter Break, we’ll start in on the Middle Ages! Thanks, Elain, for sharing your story! Sounds as if team teaching is Co-operation at its best! Having a board means you are sharing the responsibility for that group. You’re sharing the decision-making. Who wants to make all these decisions themselves about what classes will be held or where they’re going to find a meeting place or do we need insurance or a million other questions? But the most important thing a board does is to help you avoid burning out, because you’re sharing that load. And also, having a board means that you can replace yourself–that no one person is doing it all–if she is, then she is making herself too difficult to replace. There are lots of times when a leader may have to step down. Maybe because she is burned out, but also it could be that her family moves out of town. We’ve had that happen. Or maybe she becomes ill or someone in the house becomes ill, and she has to step down from her responsibilities for a while. Every group out there and every leader out there ought to be saying, “If one of us had to leave, could we keep going?” Who could step in—always have that in the back of your mind.